Amid all the high-profile releases we’ve seen so far this year, we’ve also had plenty of indie games that seem to fly under the radar. Here are my thoughts on a few that I’ve been playing: the puzzle-platformer Speer, a NES-style action adventure game called The Quest for BIG KEY, the Switch port of physics platformer TorqueL, and the gravity-based 3D platformer Defunct. Coming from one-person indie dev and0, Speer is a deceptively challenging puzzle platformer. The basic idea is simple: your character can only jump so high, but by throwing a spear into a wall, you create a platform to jump off. You can only have one spear at a time, though; as soon as you throw your next one, the previous one disappears, even if you’re standing on it. With that premise, Speer delivers some very clever puzzles. Climbing up walls with a series of jumping throws–jump, throw a spear as you rise, then land on the spear you just threw–forms the backbone of a lot of those puzzles, while increasingly complex level design keeps you in your toes. 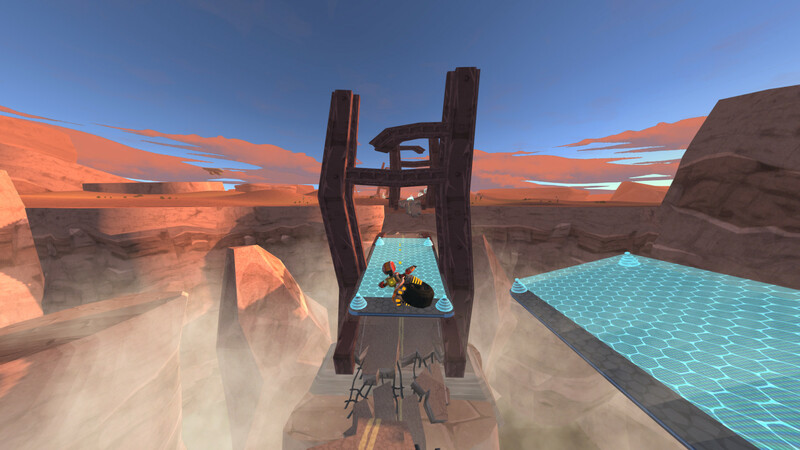 Almost every level introduces some new obstacle to deal with or design quirk to overcome, creating a steep but steady difficulty curve. Each stage is fairly brief, and respawning is instantaneous, so you can try and try again with little hindrance until you finally crack the current puzzle and move onto the next. That, coupled with oddly calming pixel art presentation, make Speer a game that’s often challenging but rarely frustrating. That’s a balance few games get right. The Quest for BIG KEY wears its inspiration on its sleeve, but it’s not simply a Legend of Zelda clone. Rather, it’s a retro-styled game that focuses on what Zelda does best: give you a world to explore at your own pace, full of secrets to find and items to collect. There are no enemies to fight, and puzzles are relatively light; it’s all about making your way around the tiled game-world, looking for the keys and other items that let you move further along. Much of the game involves finding a key to access the next area. Sometimes that’s a literal key to unlock a door, other times it’s an item that lets you bypass hazards in some way or another. One of the most creative aspects of the game is the way heart containers act as keys, in lieu of any combat purpose: often, the only way to forge ahead is to walk across deadly terrain, so having enough health to do so without dying–by finding heart containers around the map–is the means to unlocking those paths. 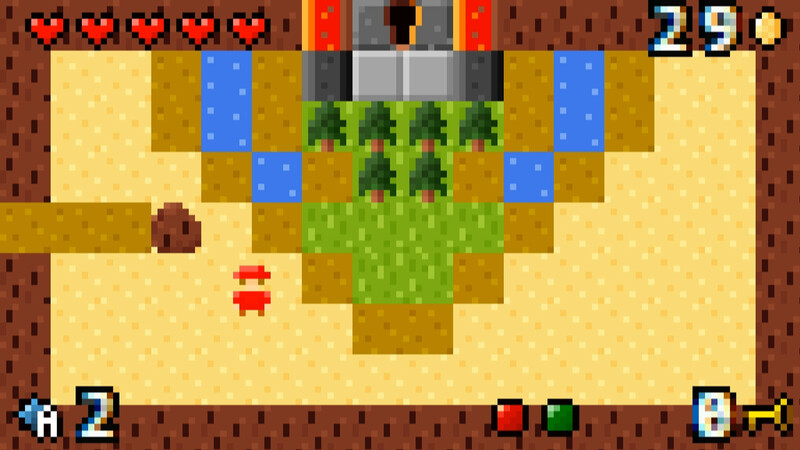 It’s a short game at around an hour or so long, which is ideal—you can just play it through in one sitting, and coupled with its relaxing pace, it’s a great way to just unwind and soak in the 8-bit inspired pixel art. There’s no save system, but given the game’s brevity and the fact that it’s generally easy enough to avoid death, this doesn’t pose much of a problem. If the idea of a short form, combat-free Zelda-like piques your interest, you’ll want to check out The Quest for BIG KEY. This unorthodox puzzle platformer first came out a couple of years ago, but its recent Switch port was my first chance to play it. I’m conflicted on it: on the one hand, it’s got some very creative design behind it, but in the other, I find it a nightmare to actually play. TorqueL centres around trying to move a square across each level by “extending” its sides and letting physics do the rest of the work. So, for example, pressing the B button extends the bottom side of the square, lifting you into the air, most likely to fall one way or another; push B firmly enough, and the rapid extension will make you jump into the air somewhat. Extending one of the sides can propel you forward, assuming there’s a wall or something to push off, and you can also roll your cube with the directional buttons. 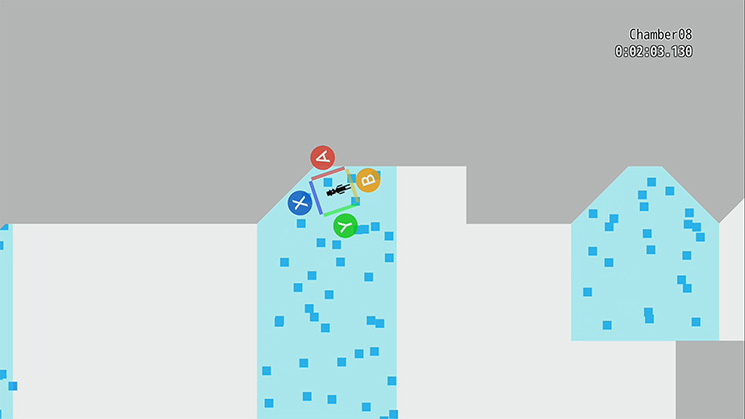 Solving each level comes down to using those limited tools to bypass all manner of obstacles, with the game’s physics both helping and hindering you at every step of the way. Like I said, it’s quite genius as a concept, but even on the early stages, actually playing TorqueL gave me nothing but frustration. Defunct is another brilliant idea held back in execution. It’s a 3D platformer, but built around a wheeled robot with little innate ability to move or jump. Instead, your robot can boost its gravitational force, which is its main means of getting around: instead of simply rolling down a hill, you dial up the gravity to give yourself extra speed, and then release said gravity to let your momentum carry you up the next incline and, in most cases, fling yourself into the air. In that sense, Defunct controls less like a typical platformer and more like a snowboarding game. That makes for some unusual and exciting platforming, as you play with gravity and use the topography of the level to do what would simply be a jump button in another game. You do have a very weak engine and a little hop, so you can’t get stuck in a valley with no way out, but it’s far more efficient and fun to start at the top of a hill, rush down it with the aid of extra G-forces, and then ride that momentum all the way to the end. Despite all that promise, though, the controls are just too unwieldy for some of the challenges later in the game, and it quickly goes from innovate to frustrating. Objectives are often unclear, and the storytelling is disjointed and difficult to follow. I also ran into a fair few game-breaking bugs, like falling through the world of getting irreparably caught on pieces of the environment. That being the case, I’d struggle to recommend Defunct–which is a shame, because it showed a lot of promise.